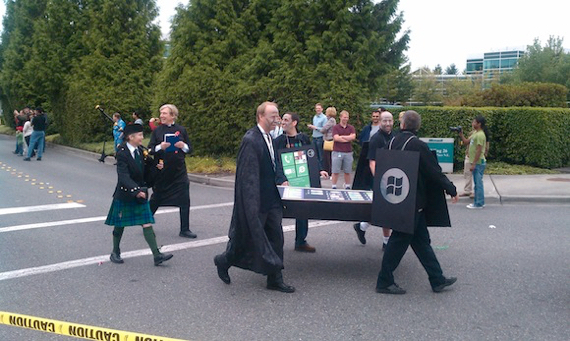 At that time, Microsoft had trash boxes around their campus for ditching one’s iPhone. 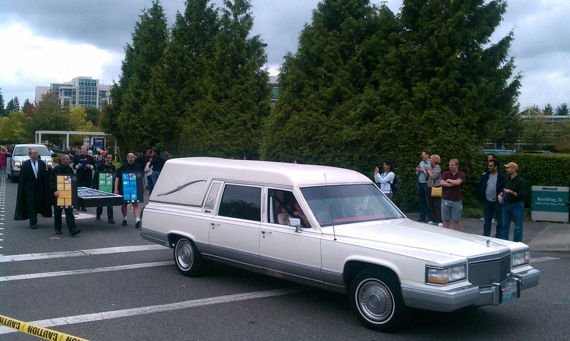 It was considered inadvisable to have an iPhone at Microsoft. It would be fun to see how many MS employees still have a Windows Phone at this point in time. I am far off by guessing the single model iPhone 6s has out sold EVERY phone with Windows phone 7,8,8.1 and 10 on it? I’m guessing it did the first weekend. A quick test to show if you are an uber-tech loser with incredibly poor judgment who should be culled from the human race – you own and use a Windows phone. The failure of Windows Phone wasn’t due to the devices being of poor quality, but due to them being much to late to market. They were late to market due to Ballmer the Clown’s inability to see the future in the iPhone. (Roll Interview for the umpteenth time.) Windows Phone itself wasn’t a bad product and one of the few post iPhone developments that showed any true uniqueness. The hearts were moving to Android and iOS by the time it was announced. At that time, you could play Ballmer chanting DEVELOPERS! DEVELOPERS! and he would have been right. He should be made to eat a plate of beaver turds and tater tots for what he did to that company. These layoffs are not due to financial reasons, well not as in desperate to save money financial reasons. Microsoft is evolving. Everything revolves around Windows for them now. 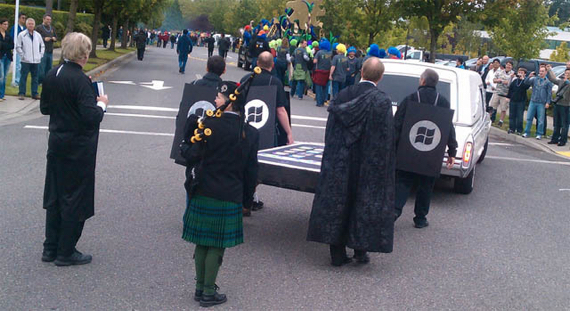 Windows everywhere, and it’s the best Windows ever. Laugh all you want but it is not buggy, it is not prone to crashing anymore than macOS, I mean when is the last time you saw a macOS machine actually crash? It’s been ages for me. Same for Windows. Blue screen of death is as rare as Kernel Panics on macOS now. And it’s fun and easy to use. Rather than the old enterprise model of sending in sales people to market lots of product to IT folks, they are shifting focus to Azure. Its the same thing I’d like to see Apple do with iCloud, i.e. create an enterprise targeted aka PRO version of iCloud. iCloud as is a consumer based suite of services, simple and primitive in nature. As much as you hear about Apple conquering the enterprise through BYOD, they’re still dependent on Microsoft to build out the infrastructure. So yeah, there will be iPhones around, but the lion’s share of enterprise dollars will go to MS.
– ENTERPRISE LEVEL OFFICE SUITE (Pages Pro, Numbers Pro, Keynote Pro), etc. Make this stuff powerful and easy to use. Hell buy DROPBOX and revamp it for ENTERPRISE FILE SHARING and Document Management. Make all of it easily accessible on iOS and macOS. Make it affordable like $40 or $50 a month. You could walk into a small business and say, “Here’s your iPad” or “Here’s your MacBook Pro” or whatever and connect them to their enterprise account and be done with it. Except if they want custom apps developed. (God hope they want custom apps developed or STARVE!!!). Probably put me out of business, but it would be good for clients. Time to move on when that happens, evolve or perish as they say! Can I interest you in some machine learning? Apple is handling all of your IT at this point. The evolution of the data center is happening anyway and MS is on top of it with Azure. They’re clearly thinking in terms of killing off their own Windows Server and Exchange Server products in favor of their cloud services. (Albeit confusing), everything you need is somewhere between Office 365 and Azure. So Microgarbage is ask(ax)ing employees to leave, then they ‘axe’ the rest? “Ax” and “axe”are different spelling of the SAME word. 1. end, cancel, or dismiss suddenly and ruthlessly. Now you can unbunch yer knickers. Well besides being an “Apple Site,” MDN is an Information Technology site. You see, both macOS and iOS devices are information technology, as was the beleaguered and late Windows phone. Analyzing what the biggest enterprise information tech company is doing, is interesting to people interested in IT. IT a phrase you might have heard before. I’m thinking that since you don’t grok the “beleaguered” reference you’re probably pretty young, 14? 15? You see, contrary to what Tim Cook says, it’s not all a world of car pool karaoke and emojis. Back in the day, before Apple was the god of all tech companies, they were having, shall we say, growing pains. (Read teetering on the brink.) The media would use the phrase “Beleaguered Apple” incessantly to describe the company. The media was no better back then than they are now. Oh I remember when Apple was teetering on the brink of extinction and Microsoft bailed them out. So back then beleaguered would be a perfectly acceptable word to describe Apple. I would also agree that you could call Microsoft’s mobile ambitions beleaguered. But that’s not what the article is about. I didn’t mean to offend to. I forgot how Apple fans are so easily offended. I’m also well aware what IT means and am considerably older than 14 or 15. Maybe you should try and act older than that. Microsoft did not “bail out” Apple. There was no bail out. They made peace. MS was in the cross hairs of DOJ for a monopoly and being sued by Apple. MS agreed to keep developing MS office for Mac and bought some stock in apple to settle their suit with them. They later cashed out the stock at a good profit (irony alert).They also thought that would make them look venter in DOJ eyes. 1. Terminating thousands of employees = Streamlining a particular department to better serve it’s customers and shareholders. 3. Anyone with half a brain could figure that out. 1. Microsoft is being forced by Apple to remake their entire business. And still my accountant, attorney and stock broker continue to beg me to sell my Apple stock and buy Microsoft! They have been doing that for 20 years. They all tell me I’m crazy, but I explain that I’m a million dollars less crazy than I was 20 years ago. I feel sorry for the people that will be losing their jobs and hope they find new employment soon. I don’t feel sorry for Microsoft.